Heat oven to 425°F. Line cookie sheet with foil; spray with cooking spray. Mix Bisquick mix and taco seasoning in 1-gallon resealable plastic food-storage bag. Dip half the chicken strips into egg; place in bag of Bisquick mixture. Seal bag; shake to coat. Place chicken on cookie sheet. Repeat with remaining chicken. Drizzle butter over chicken. Meanwhile, in separate small bowls, mix the Creamy Green Chile Dipping Sauce and Salsa Sour Cream Dipping Sauce until each is well blended. 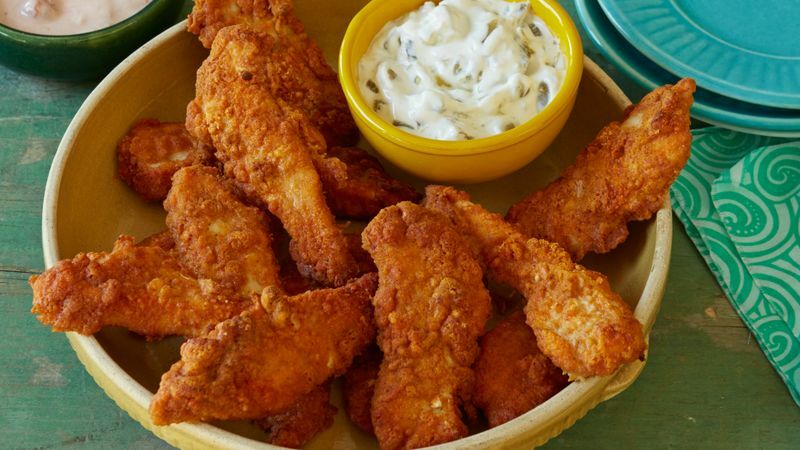 Serve chicken fingers with dipping sauces.